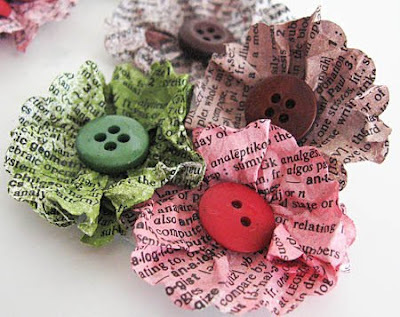 I love making these Dictionary Flowers!! 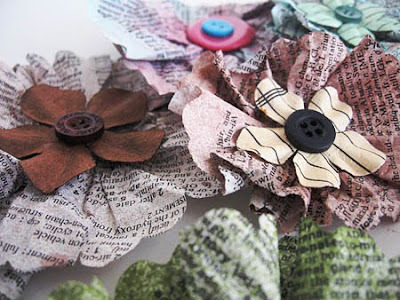 One day I happened upon a great blog post from Leah Fung from Scrapbooks, Etc magazine and she showed you in a video how to make these yummy dictionary paper flowers. So last weekend I met up with a friend and we went CRAZY making tons of these flowers in all shapes and sizes. Below these flower pictures I listed some tips that I learned from playing. TIP #1 - Dictionary paper works best, it's not too think and not too thin. I just went to the local thrift shop (D.I) and I bet some of those used book shops would be a good place to look. Plus it was only $3...and it will make TONS of flowers. 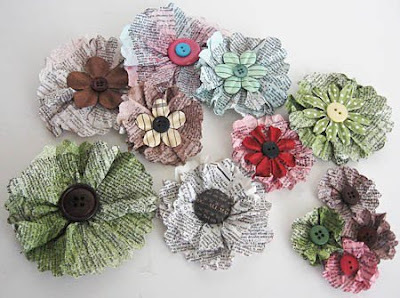 TIP #2 - In the video they top off the flowers with other paper flowers and buttons, but I have to admit that I think the iTop Brads really finish off these flowers so much better. I would suggest poking the ned of your scissors through the center before it dries completely...the glue may not have set all the way and it's a little thick, but you can push through and make a nice small hole that you can slide your iTop brad through the hole. TIP #3 - This process is messy but super fun. I used both spray mists from Tattered Angels and Maya Mists...they both work great. 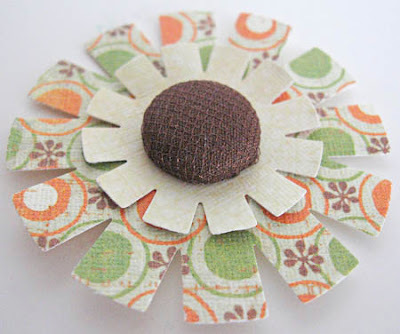 TIP #4 - Don't worry about die cutting the flowers. I just folded it like I would if I were cutting out a snowflake and then used my scallop scissors to cut off the top. Since you crinkle these up they don't have to be perfect to begin with!! 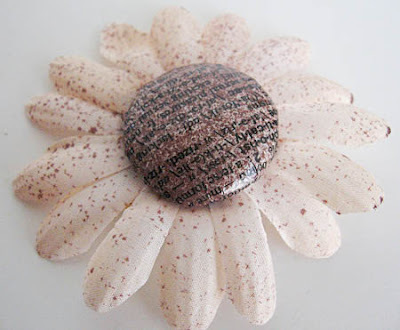 Spattered Daisy: This is a plain cream silk flower that I spritzed with brown glitter spray. I created the center with by covering a large iTop Brad with dictionary paper that I'd sprayed with brown glitter mist and then coating it with Diamond Glaze. iTop Punch Flower: This flower was created with the large and small iTop Punches. The center is a small iTop brad covered with brown fabric and tulle. Fan Folded Flower: These flowers were fun to create and easy. 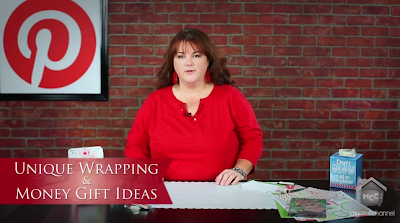 Cut a 1" x 12" strip of paper and score it every 1/4". Once you have it scored, start folding it back and forth like a fan. 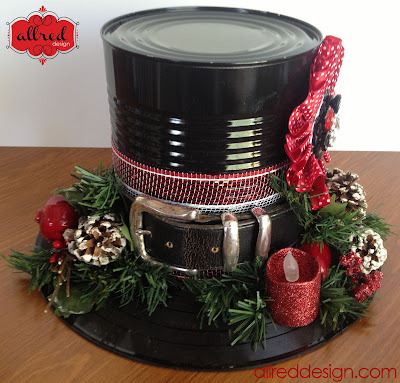 Then adhere the ends of the fan together and push the center down to create the circle. Adhere the center of the flower to a scrap piece of paper under the center (I poured liquid glue in the center and held until it dried). 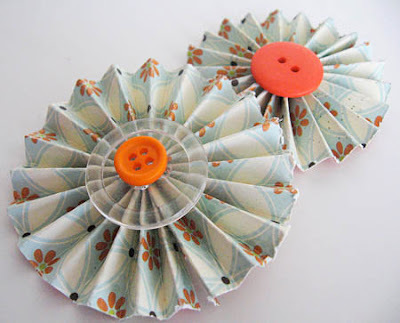 Then simply adhere the buttons of your choosing to the top of the circle flower. 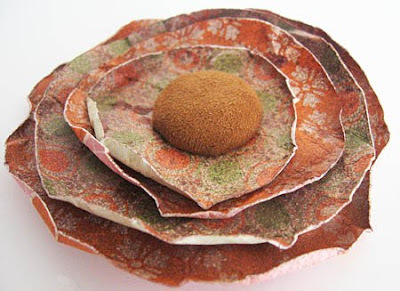 Crinkled Layered Flower: Loved these fun circle flowers too! You simply need to a cut out circles about a 1/2" difference in size. Spray with glitter spray and crinkle up, flatten out and roll edges. 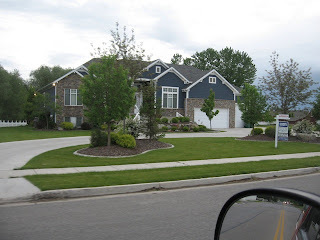 Set the circles aside until they dry and pile on top of each other. I then covered a large iTop brad with suede and pierce through all the circles. Voila...that's it!! 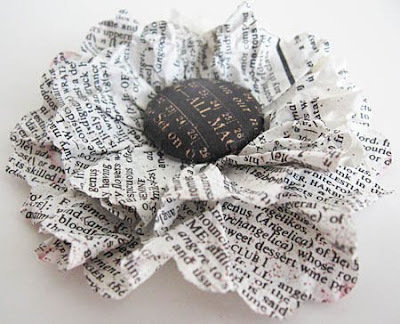 The first dictionary flower at the top of the page (with black center), is this a fabric covered button? Luv it! It's actually paper. I used the Imaginisce i-top Tool for all the centers. Some at the bottom of the post are covered in suede or other fabrics, but I prefer paper the most. Love that tool! !